In the first of a four-part interview with John Barnes, the legendary Liverpool midfielder speaks to This Is Anfield about the inspiration behind a new film entitled Poetry In Motion. Barnes has co-produced the film, which chronicles his journey from life on an army base in Jamaica to the pinnacle of English football. This Is Anfield’s Jeff Goulding spent time talking to the former Liverpool and England midfield maestro about his new project and so much more. Here is the first of a four-part interview with the Anfield icon, looking at the inspiration behind the film, Barnes’ upbringing, and his early career. 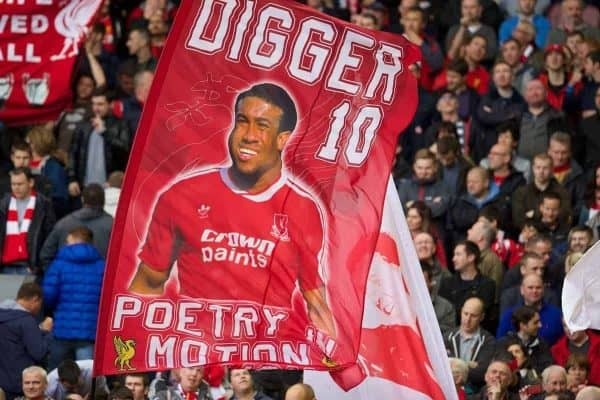 John Barnes: Poetry in Motion is a fascinating and often moving, depiction of the rise of a Kop idol, from his beginnings on a military base in Jamaica, where his father served as a Colonel, to life at Anfield and beyond. It includes contributions from the player himself, former Watford, England and Liverpool teammates and thoughts of supporters and some of the key people in his life. The video also contains archive clips from some of the most memorable moments in the legend’s career. I asked Barnes about the motivation that lay behind the film and how he felt about it. Barnes dedicates the movie to his father, Colonel Roderick Kenrick “Ken” Barnes, who was himself a remarkable figure. Ken Barnes was a military officer trained at the prestigious Sandhurst military school, where he became a heavyweight boxing champion. He played for and managed the Jamaican national football team, represented his country playing Squash and was a keen rugby player. Barnes’ life, therefore, was shaped by high-achieving parents who had a fierce passion for sport; his mother, Frances, also played tennis. I wondered if that early environment and upbringing was the catalyst for his incredible footballing career. I ask if he felt that growing up in the footsteps of such remarkable characters had a profound influence on his rise to football stardom. Barnes is emphatic in his answer. “It had a huge influence on my life, never mind my career. “People talk about footballers and sportsmen as role models. I disagree. I think your biggest role models are your parents. “You don’t really think about it until you finish because you look at players you like, people in the public eye you admire but ultimately, if you have good parents they influence you, even subliminally, even without you knowing it. “A lot of what you achieve in life is down to the way you were brought up. Interestingly, John Charles Bryan Barnes, to give him his full title, owes his very name to one of his father’s footballing heroes. John Charles was a Welshman who played for Swansea Town and Leeds United, before going on to feature for Juventus and Roma in a career that spanned almost 30 years, from 1946 to 1974. So how does a Colonel serving on a military base in Jamaica come to name his son after a Welsh footballer? Barnes explains: “Yeah, John Charles was one of my dad’s favourite players. “You may be too young to remember, but at one time he was one of the best players in the world. I’ve no idea where Bryan comes from though,” he laughs. 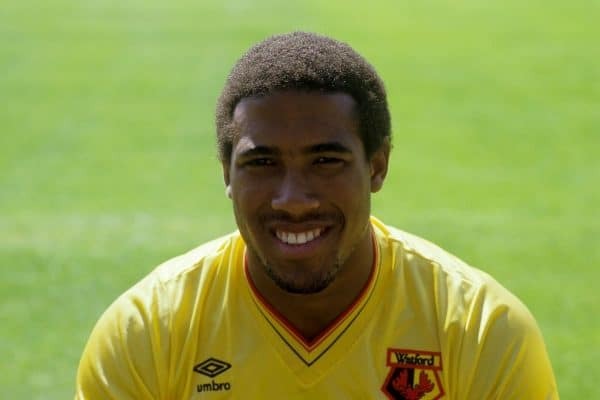 In 1976, the shifting sands of Jamaican politics and his father’s decision to take up a position as military attache in the UK would propel Barnes on a path to footballing stardom. In the film, he recalls flying into Heathrow airport and seeing kids his own age playing on frozen football pitches. It had a profound effect on him. I wonder whether the young Barnes held ambitions to carve out a professional career in the game at the age of 12? Not so. Instead, it seems he had far more down-to-earth aspirations when it came to football. “I never dreamed of playing football professionally,” he says. “My dad was military attache for four years, so I knew I was going back to Jamaica in four years. “But, I knew I would play, because I was good at football and I would always play. If you look all over the world, even where they don’t have professional associations, people still play football. 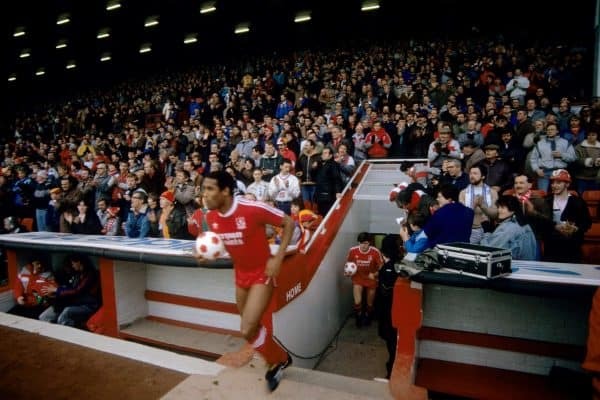 The film gives a fascinating insight into the attitude and commitment of a young John Barnes. Former team-mates recall how, faced with a team laden with strikers, John agreed to play in defence. He would tell the others that he was playing there because he was more dedicated to his craft than them. The youngster was clearly a supremely gifted young prospect. However, perhaps it was also his application and hard work that eventually caught the eye of others. The story of how Barnes came to sign for The Hornets is covered in the film, along with archive interviews with his former manager Graham Taylor and his team-mates. Taylor, with some amusement, describes how the young star had been spotted by a supporter who was a taxi driver, playing for Sudbury Court in the Middlesex league. The cabbie quickly recommended the player to Watford and the club needed just half a game to realise they had unearthed a talent. They signed him up immediately. I’m struck by how remarkable it is that such a promising career could easily have faded into obscurity, but for the keen eye of a taxi driver. As a Liverpool supporter, I am aware of a number of former stars and legends who owe their careers to such happenstance. I put it to Barnes that he shares his story with other Liverpool greats. “That’s not just Liverpool’s story,” he points out. “That’s everybody’s history because that’s the way it was in the 70s and 80s. To be a footballer, you had to be lucky enough to be spotted. The idea that such prodigious talent was going unnoticed on amateur football pitches across the country, in the 70s and 80s, is a sobering thought. Watford, Liverpool and English football owe that cab driver a huge debt of gratitude. Watching the film, I am reminded of what an incredible job Taylor did with Barnes. It’s something the player himself recognises, as well as pointing out his former manager’s successes at Watford. Perhaps spoiled rotten by the Reds’ glory years in the eighties, I had forgotten that, bankrolled by legendary musician Elton John, The Hornets had at one stage finished runners-up to Liverpool, were beaten finalists in the 1984 FA Cup final and had reached the quarter-finals of the UEFA Cup. Their rapid progress meant that Barnes had initially felt his footballing ambitions could be achieved under Taylor’s guidance. However, it wasn’t to be and the manager would eventually be replaced by Dave Bassett in 1987. By then, John Barnes had already agreed to go to Liverpool. I am keen to discuss the move and in particular Alex Ferguson’s claim that he passed on the opportunity to sign the star for Manchester United. We’ll come to that, but first, we linger a while longer on his time at Vicarage Road. I remark on the fact that, outside of Watford perhaps, the achievements of his former manager and team-mates in that period aren’t really remembered in the way they should be. Barnes laughs. “When you’re a Liverpool fan and your team are winning, you don’t care. You maybe notice United or Everton finishing second, but not Watford. In the end, Watford‘s light would dim and Barnes would be given the opportunity to play on a much bigger stage. In January 1987, Anfield and Kenny Dalglish came calling. What followed was a decade of remarkable success, in which John Barnes came to be regarded as one of the greatest players in Liverpool Football Club history. * ‘John Barnes: Poetry in Motion’ is available on DVD, here.